Much of the dialectics involving revolutionary movements and counter-revolutionary responses gravitate around protagonists’ grand narratives, or master frames, making unyielding claims about the origins, evolution, cleavages and nature of their conflicts. Five years into the Syrian conflict competing master frames have proven to be as powerful as they are inadequate, incomplete or outright inaccurate. Noticeably, and despite the conflict having gone through numerous mutations from a mass uprising into an internationalised civil war, the essence of two key master frames has not significantly changed; the regime and its supporters still purport that they are fighting a necessary war against a violent jihadist conspiracy fuelled by sectarianism, and despite their differences otherwise most opposition activists of various denominations insist on what they see as a revolution against oppressive, authoritarian rule by a regime whose violent intent to persist has no bounds. That such stories fail to capture the complex dynamics of the conflict should not come as a surprise. They are largely meant to mobilize and muster support behind, respectively, revolutionary and counter-revolutionary agendas; not to accurately document and analyze the conflicts fuelled by them. Yet the “trouble with stories” hits the level of scholarship when analysis gets entangled in them. Nothing seems to illustrate this better when it comes to assessing the onset of sectarian contention, early anti-regime (‘terrorist’ or ‘revolutionary’) violence, and the connections between them. As appraisals of these fundamental themes continue to inform both master frames and, concurrently, analyses of the ongoing Syrian conflict, a retrospective may be helpful both to better understand the regime’s longevity, seemingly against all odds, and to encourage researchers to study these master frames without letting them determine their own analysis. Perspectives on the onset of anti-regime violence have been not been very different. While excellent work already has been done on Islamist-jihadist groups and their violence, we still lack detailed and perceptive analyses of the early stages of anti-regime violence, or the use of armed force against regime targets during the crucial first months of the uprising. A handful of articles focusses on violence in the conflict but, apart from studies of jihadist violence at later stages of the conflict, they mostly single out the regime’s brutality. Many general studies of the conflict, including scholarly texts and otherwise thorough journalism, reiterate the common narrative among opposition activists wherein soldiers who were ordered to shoot at unarmed protestors defected for moral reasons, joined the demonstrations for protection against the regime’s unremitting onslaught, and thus inevitably militarized the uprising in the process. Again, a mix of the conflict’s high stakes, a moral imperative not to contradict the regime’s victims’ narratives, and fears within the study of violence in the Middle East generally to come across as condoning culturalist accounts may have added to the steep challenges of studying the Syrian conflict from a distance. 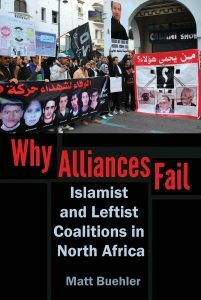 Some scholars within Middle East studies may also have shared Syrian activists’ frustration with the Left. 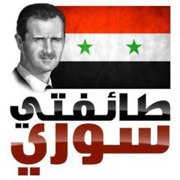 As Syrian writer Bodour Hassan put it, Syrians do not “owe explanations and justifications to those who dismiss their sacrifices and insist on supporting and even glorifying revolutionary violence everywhere except in Syria.” This all is understandable as revolutionary narratives have been largely drowned by crude depictions of the Syrian conflict as a struggle against jihadist extremism. Indeed, initially peaceful and inclusive features of Syria’s popular uprising deserve be told and heard. Yet some questionable assumptions and omittances in the opposition’s master frame with regard to early anti-regime violence and sectarianism should not find their way into scholarly work on the conflict. The master frame of the Syrian opposition on the conflict leaves a lot to explain. Starting with accounts of anti-regime violence embedded in army defections, the latter appear to have gained sizeable proportions only after anti-regime violence reached significant levels during the first few months of the uprising. 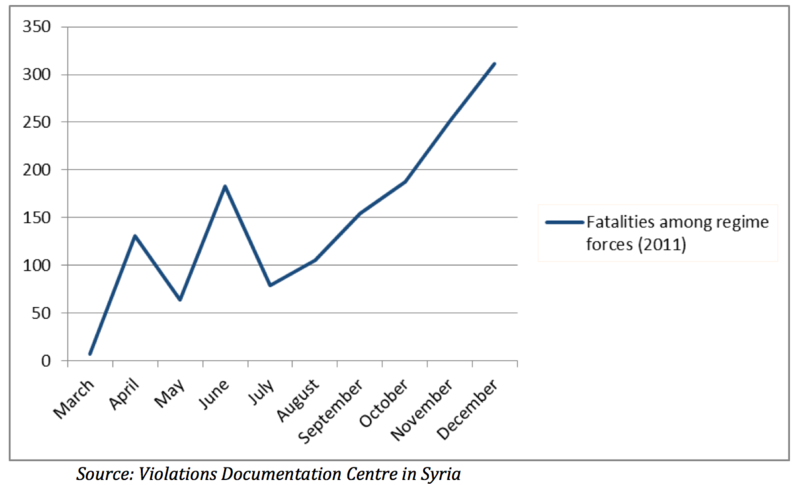 We can roughly approximate the onset and evolution of anti-regime violence by looking at estimates of regime fatalities documented by the Violation Documentation Centre in Syria (VDC, see Figure 1) that, contrary to most other Syrian human rights organisations, does not limit its documentation to ‘martyrs’ of the revolution. By and large, these estimates are congruent with the regime’s own claims of casualties suffered until August 2011 due to ‘terrorist’ activities. Albrecht and Koehler’s estimates of desertion trends, based on their extensive interviews with deserted soldiers and officers, suggest that desertions only reached significant and growing levels by early 2012 while they were limited to much more isolated incidents prior to this date. They add that only half of respondents effectively defected to the opposition, or actively joined armed rebel groups, thus further narrowing down the relevant numbers of deserters before the end of 2011. It thus appears implausible to attribute significant levels of early anti-regime violence solely or even predominantly to them. This seems corroborated by the limited scale of reported attacks by armed groups involving defectors until at least November 2011. The Khalid Bin Walid Brigade was one of the first groups to emerge. It was involved in anti-regime skirmishes and ambushes as early as June in neighbourhoods of Homs and Rastan, but the scope of its operations was extremely modest, at least so until September-October. Major anti-regime violence involving army defectors occurred in Jisr al-Shughur in June. Widely regarded as the first major instance of armed rebellion, the scale of the violence there was a forebode of what was to come – scores of regime soldiers and security forces were killed. Yet at the time the violence in Jisr al-Shughur was exceptional as defections occurred on the spot when soldiers refused orders to shoot at protestors, resulting in immediate clashes between loyal troops and defectors; most desertions elsewhere were more carefully prepared and typically occurred when soldiers were on leave and with their families. Following a regime crackdown the area witnessed no significant attacks until Free Syrian Army groups captured it in December. Fighters who later formed the Suqur al-Sham Brigade pushed regime forces out of villages in Jabal al-Zawiya in July and August but significant clashes in this area only reached significant and sustained levels in October. In the greater Damascus area, armed groups of defectors and civilian volunteers, such as the Abu ‘Ubayda Ben al-Jarrah Battallion, emerged in September, and began to carry out hit-and-run attacks only from November onwards. Likewise, defector groups began to carry out armed operations in Dar’a and north of and around Hama by November-December. Neither does the opposition narrative on defections explain why early anti-regime violence, or ‘armed resistance,’ witnessed significant geographical variation (see Figure 2). Indeed, if defections in response to regime repression had driven early anti-regime violence one would have expected Dar’a to have been at the epicentre of ‘armed resistance,’ with or without defectors’ involvement. As noted above, defector groups began armed activities in Dar’a much later in the year. Looking beyond the prism of alleged defection effects, geographical variation in anti-regime violence has been suggested to have been driven by other factors. For instance, it has been variously argued that tribal or clan-based social structures helped to motivate, inform and/or enable civilians taking up arms against the regime. Yet again this somehow causes Dar’a to be an anomaly while low levels of anti-regime violence, and indeed modest levels of anti-regime protests, in tribally dense areas like Deir az-Zur and Raqqa remain unexplained. Indeed, tribal organisation and social structures seem a poor predictor of regime loyalty and/or opposition generally, even when in Dar’a and other ‘early risers’ tribal structures or more loosely based clan associations played a key role in anti-regime mobilization. I propose that areas’ mixed sectarian composition may be a more fruitful starting point for analysing early anti-regime violence. Accordingly, growing anti-regime violence in Homs, Hama, Latakiya and Tartus governorates could be viewed against the background of local dynamics framed, experienced and informed by sectarian factors. Without necessarily having to resort to primordialist, culturalist or reductionist perspectives, this brings into focus the sectarian context of early anti-regime violence. To my knowledge, Nayruz Satik is one of the very few authors who chronicled in detail the rise of sectarian sentiments and associated incidents of early opposition violence — including abductions and assassinations — in Homs, Latakiya, Hama countryside, and Baniyas in Tartus governorate; these incidents remain largely unreported in both Western and Arabic media, and mostly ignored in academic writings on the conflict. An exception is Rosen’s coverage who provides a thorough journalistic account of sectarian responses to the regime’s clampdown and early formation of armed groups in Homs and Latakiya during the first six months of the uprising; events that by the summer of 2011 escalated into anti-regime violence setting neighbourhoods and villages against one another. Concurrently, sectarian narratives increasingly gained acceptance at a mass level as, for instance, the famous protest song from Homs, “O, our beloved nation,” was adjusted to include sectarian denunciations of the regime. “My sect is Syrian.” Billboard viewed in Damascus only weeks into the uprising. Illustration kindly provided by Kholoud Mansour. In short, cognitive and emotional responses cast in sectarian terms are likely to have been at the root of local pro-regime mobilization and anti-regime violence alike, and they may have resonated and amplified by way of the intimacy of ‘the other’ in mixed sectarian settlements. Reversely, it may not be a coincident that more homogeneous areas initially witnessed no or much less sectarian agitation and were relatively late in taking up arms against the regime, despite being hit by regime brutality and sieges. As Syrian activist Haytham Manna’ put it in April 2012, “One can take pride in the fact that after thirteen months there is not a single sectarian incident in the governorate of Dar’a. This cannot be said of other regions [..].” From a counter-revolutionary perspective, the regime steadily built its own master narrative of accusing its opponents of sectarian bigotry and violence just as it drove and magnified sectarian clashes in especially Homs, Hama and Latakiya governorates. While in hindsight the Syrian uprising in its first few months may this way have looked set to enter violent pathways, regime repression and sectarian boundary activation alone cannot explain why protestors’ early insistence on non-sectarian, inclusive and non-violent action was overtaken by events. For mobilization to stick to peaceful methods, Pearlman argues, what is generally required is a coherent and strong movement leadership to enforce strategic discipline. Yet in the Syrian uprising, of course, a revolutionary leadership developed only slowly and disjointedly while mass mobilization spread across the country. As many have pointed out, such resulted from decades of authoritarian governance practically sniffing out any form of political or even social collective organisation. While the lack of a strong revolutionary leadership hampered regime efforts to arrest the movement, it also precluded a strategic and authoritative insistence on inclusive and non-violent methods or, alternatively, a strategy to incorporate armed struggle at the service and under the control of such a revolutionary leadership. This was not for a lack of trying, as Local Coordinating Committees (LCCs) that sprung up to organize mobilization and to assist protestors during the regime’s onslaught publicly announced their peaceful and anti-sectarian intentions, and strongly denounced those violating these principles. Their initiatives aimed to counter rumours of sectarian strife by opening channels of communication among communities, and helping to mediate in inter-sectarian incidents of violence at a local level. Yet by July-August 2011 the uprising’s budding leadership proved to be too weak and fragmented to provide a clear, coherent and authoritative answer to growing popular sentiments viewing a non-violent path as inadequate or outright naive in the face of the regime’s repression. Expressing his impatience with “purist” views questioning the morality or wisdom of taking up arms against the regime, Syrian activist and author Yassin al-Haj Saleh commented on the turn to anti-regime violence by writing: “[W]e don’t have a choice. The military component of the revolution is a side effect of the regime’s essentially violent nature: nobody wanted it or planned for it.” Yet this lack of planning pertaining to the early stages of the uprising’s militarization also caused the emerging revolutionary leadership to be overtaken, and increasingly to be made irrelevant, by those outside the LCCs and the peaceful protest movement. Indeed, as it turned out, resorting to military means framed largely by sectarianism became a platform by which numerous contenders vied for control and leadership of the movement by directing violence against the regime as much as against their rivals in an increasingly amorphous and radicalized opposition. By mid-2012 jihadist groups of various kinds became well positioned to win this contest as they were endowed with a thoroughly sectarian repertoire resonating with and amplifying sentiments during the early stages of the uprising, with military skills and experience to address real and perceived insecurities, and with funding from abroad to embark on a sustained insurgency. Combined with relentless regime violence and sectarian incitement, the Syrian revolution was set on a path of what Al-Haj Saleh called “wartime nihilism,” characterized by a loss of hope, the use of blind violence and increasingly dominant Islamist extremism. The Syrian regime’s counter-revolutionary responses have been both brutal and perversely sophisticated as it unleashed an array of tactics and strategies against unprecedented challenges since 2011. Arguably, virtually all of its responses and adaptations have been premised on its master narrative emphasizing a violent jihadist conspiracy fuelled by sectarian bigotry. It is not alone in this as other authoritarian regimes in the region, from Saudi Arabia to Bahrain, similarly framed their clampdown on mass dissent and anti-regime mobilization by labelling their opponents as sectarian-driven, violent zealots or ‘terrorists.’ While from a scholarly perspective we should loudly reject such narratives as deceptive and self-serving, it does not follow that we should uncritically embrace revolutionary master frames. Apart from Nayruz Satik, as cited above, a few Syrian writers have courageously started to reassess the role of sectarianism and anti-regime violence. Yet ironically, some of their accounts tend to adopt the very cultural framework correctly resisted by activists and scholars alike. More generally, we need to know how and why Arab regimes’ counter-revolutionary framing turned out to be so successful and enduring, at least in serving their determination to persist at all costs. Some of the answer, as I argued in the case of Syria, lies in the ways in which sectarianism resonated in existential fears triggered by the prospect of profound political change and fears of regime brutality. It points up to the ways in which regime repression was intentionally cast to trigger boundary activation and violent responses where sectarian threats were sensed at their most intimate level. It also features a revolutionary leadership that valiantly emerged out of decades of authoritarian rule but failed to prevent the cycles of sectarian violence that ensued. Pursuing this analytical perspective does not force us to trespass the slippery slopes of culturalism or to deny the regime’s brutality. Yet it may contradict revolutionaries’ own narratives. Charles Tilly, Stories, Identity, and Political Change, (Lanham: Rowman & Littlefield, 2002), 35. See e.g. Christopher Phillips, “Sectarianism and Conflict in Syria,” Third World Quarterly 36.2 (2015), 357-376. Cited in resp. The Washington Post, 13 January 2016 and Jeffrey Goldberg, “The Obama Doctrine,” The Atlantic, April 2016. Stathis N. Kalyvas, “The Ontology of ‘Political Violence’: Action and Identity in Civil Wars,” Perspectives on Politics 1.03 (2003): 882. For an excellent but in this context wanting analysis see Robin Yassin-Kassab & Leila Al-Shami, Burning Country: Syrians in Revolution and War, (Pluto Press, 2016), chapter 5. Laleh Khalili, “Thinking About Violence,” International Journal of Middle East Studies 45.04 (2013): 791-794.
 https://www.vdc-sy.info/index.php/en/ VDC data should not be taken at face value. Yet in this case they are more likely to understate (regime) casualties. Reuters, 31 May 2011, “Note Verbale Dated 27 June 2011 and 16 August 2011 From the Permanent Addressed to the UN High Commissioner for Human Rights,” http://www.ohchr.org/Documents/countries/SY/Syria_Report_2011-08-17.pdf. Note that the regime may have had reasons both to exaggerate and/or downplay the number of fatalities. Human Rights Watch, ‘By All Means Necessary!’ Individual and Command Responsibility for Crimes Against Humanity in Syria, 15 December 2011. Haian Dukhan, “Tribes and Tribalism in the Syrian uprising,” Syria Studies 6.2 (2014), 1-28. Reinoud Leenders & Steven Heydemann. “Popular Mobilization in Syria: Opportunity and Threat, and the Social Networks of the Early Risers.” Mediterranean Politics 17.2 (2012), 139-159. Nayruz Satik, “al-Hala al-Ta’ifiya fi al-Intifada al-Suriya,” in: Arab Centre for Research and Policy Studies, Khilafiyat al-Thawra. Dirasat Suriya, (August 2013), 373-427. A second version of the song, originally composed by Abd al-Basset Sarut and first heard in June 2011, added the following phrase: “The Throne is gone, as is the future of the Safavide gang.” For further details see: Simon Dubois, Présentation et analyse de chants issus de manifestations du printemps Syrien, Mémoire de Master, Université Lumière Lyon II, 2012, p. 149. Stuart J. Kaufman, Modern Hatreds. The Symbolic Politics of Ethnic War, (Cornell University Press, 2001), 19. For an account of such local perceptions in Alawite communities see Rosen, “Assad’s Alawites,” and Aziz Nakkash, The Alawite Dilemma in Homs. Survival, Solidarity and the Making of A Community, Friedrich Ebert Stiftung, (March 2013). Charles Tilly, The Politics of Collective Violence, (Cambridge University Press, 2003), 21; Eddie Hartmann, “Symbolic Boundaries and Collective Violence. A New Theoretical Argument for an Explanatory Sociology of Collective Violent Action,” Journal for the Theory of Social Behaviour (6 October 2015), 1-22. See also Barry R. Posen, “The Security Dilemma and Ethnic Conflict,” Survival 35.1 (1993): 27-47. Note that this approach cannot explain significant levels of early anti-regime violence in Idlib; here regime fatality numbers may have been largely driven by events in Jisr al-Shughur. Wendy Pearlman, Violence, Nonviolence, and the Palestinian National Movement, (Cambridge University Press, 2014). Salwa Ismail, “The Syrian uprising: Imagining and Performing the Nation,” Studies in Ethnicity and Nationalism 11.3 (2011), 543-6. Yassin al-Haj Saleh, La question Syrienne, (Sindbad Actes Sud, 2016), 96-122. Reinoud Leenders, “Repression is Not a ‘Stupid Thing’ – Syrian Regime Responses to the Syrian Crisis,” in: Michael Kerr and Craig Larkin (eds), The ‘Alawis of Syria – War, Faith and Politics in the Levant, (Hurst Publishers, Oxford University Press U.S., 2015), 245-274. See e.g. Hassan Abbas, “Between the Cultures of Sectarianism and Citizenship,” in: Malu Halasa, Zaher Omareen and Nawara Mahfoud, Syria Speaks: Art and Culture From the Frontline, (Saqi Books, 2014), 48-59. However, Abbas is careful to heavily historicize, contextualise and qualify his focus on “sectarian culture” exactly to avoid culturalist reductionism.